Culturing marine ornamentals is a lucrative and environmentally sound alternative to harvesting them from their reef habitat. Unfortunately, the practice still greatly lags the farming of freshwater tropicals because of the biological and economic constraints associated with culturing most species. Many species have not been cultured because of their complex reproductive biology; others can only be raised a few individuals at a time; and for those that can be raised in large numbers, production is often not cost-effective compared to their wild-caught counter-parts. As of 2017, 330 of over 2,250 traded marine aquarium fishes species have been cultured. Of those about 65 species (4%) have been captive-bred commercially and about 30 of these are in production at any one time; mostly clownfishes, dottybacks and sea horses and a limited number of goby, blenny, cardinalfish and angelfish species. The remaining 260 marine aquarium species have been cultured for experimental purposes only (see captive-bred species list for details). The retail trade of marine aquarium fish is valued at close to half a billion dollars a year, with 18 to 30 million marine fishes traded globally each year. Unlike freshwater fish of which more than 90 percent are cultured, nearly all marine species are taken from the wild. The effects of aquarium fish collection have raised serious concerns. Destruction of the reef community. High mortality of collected organisms. Over harvesting of less common species. The Philippines and Indonesia are the two largest exporters of marine ornamentals and are home to some of the most magnificent and diverse coral reef systems in the world. Collectors in these countries widely use sodium cyanide to anesthetize and capture aquarium fish. This method is more prolific than using nets and has been promoted by the exporters in these countries. Cyanide is a poison that will kill corals at low concentrations. Now in both countries, the reefs where collection takes place are in poor condition, characterized by largely dead and broken coral overgrown with algae. Severely damaged coral reef in Raja Ampat, Indonesia. Exports from these countries has decreased in recent years due to the poor reputation of their fish and increased awareness of reef destruction. Attempts have now been made to reform collectors, training them to use nets rather than cyanide, but progress has been slow because the lacking economic incentives provided by the buyers. Even today cyanide fishing is widespread and increasing throughout the South Pacific and Southeast Asia because it is profitable. A fish’s journey from collection to the retail store is a traumatic one. Removal from its natural habitat, decompression, handling, packaging, long flights, crowding and acclimation to numerous holding facilities are stresses that will weaken a fish’s natural resistance and immunity at a time when it is exposed to a variety of diseases. On average, one out of every ten fish dies from reef to retail. This figure increases with more intense collection methods and reduced care during distribution. Cyanide-caught fish suffer the highest mortality. At high concentrations the poison constrains oxygen metabolism ensuring a rapid demise while at low concentrations cyanide blocks liver function leading to a slow death over many months. Mortality estimates of cyanide-caught fish from reef to retail exceed 90 percent. Reef fish are very prolific spawners and it has been shown that the population size of more common species is more limited by the amount of available reef habitat than the number of spawning adults. Sustainable collection of such species is therefore quite feasible. However; aquarium fish collectors can be quite selective and often capture large quantities of less common, higher valued species, resulting in overexploitation and subsequent depletion of those wild stock populations. This problem is compounded with ever decreasing habitat availability from reef damage caused by human activities and climatic change around the world. Fish collector in Hawaii with a net full of flame wrasses (Cirrhilabrus jordani). In a perfect world all aquarium species would be captive-bred. Unfortunately, at present, farmed fish alone cannot fulfill the demand of our hobby. Until the technology exists to mass culture common, in demand species like yellow tang and flame angelfish, efforts must be placed on developing and maintaining sustainable collection practices. They are net-caught without causing damage to the reef environment. They are properly decompressed, handled, held and transported. Minimizing mortality from reef to retail must be of utmost priority. The collection quantities do not deplete the natural wild stock populations or negatively impact the reef environment. Only abundant species should be collected. Captive-bred fish can be cultured disease free and are healthier when you purchase them. Collected fish undergo a traumatic journey from the reef to the retail store. Removal from their natural habitat, decompression, handling, packaging, long flights, and acclimation to numerous holding facilities are stresses that will weaken their natural resistance and immunity at a time when they are exposed to a variety of diseases. On the other hand, farmed fish are raised disease free and usually supplied directly to the retail shops, which makes them healthier animals when you purchase them. Captive-bred fish thrive on conventional aquarium fish foods. Captive-bred fish are raised on prepared aquarium foods from the time they are young juveniles. 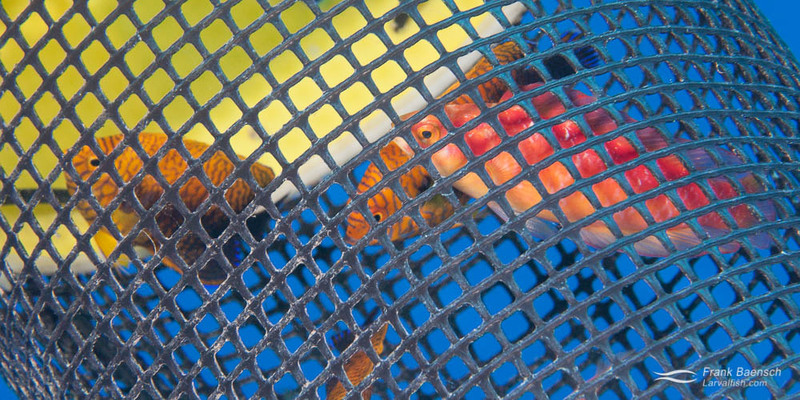 Newly purchased captive-bred fish will easily begin feeding and remain colorful and healthy on quality flakes, pellets and frozen foods. Captive-bred fish will easily adapt to a new tank environment. Being raised in captivity and accustomed to aquarium life captive-bred fish will more easily adapt and remain healthy in your tank than wild-caught individuals of the same species. Keeping captive-bred fish will reduce the incidence of disease in your tank. Captive-bred fish are less aggressive. Farmed fish are raised in a far less competitive environment than wild fish grow up in. As a result, they usually peacefully coincide with their tank mates making it easy to keep different species of the same family or even genus together. For example, I have kept captive-bred flames, lemonpeels, fishers, interruptus, resplendens and multicolors all together in the same tank without aggression. Captive-bred marine ornamentals are an environmentally sound product. Wild reef organisms are often obtained using intense and selective collection practices. These have proven destructive to the coral reef habitat; result in high mortality of collected organisms; and may deplete wild stock populations, especially of less common species. By purchasing captive bred animals you are helping keeping these animals where they belong: the coral reef. Captive-bred fish can get sick. While healthier and more adapted to aquarium conditions than wild fish at the time of purchase they will require good nutrition, care and a stable tank environment. 16,000 fish species inhabit the oceans (Census of Marine Life, 2010). 150-200 new marine fish species being identified annually (Census of Marine Life, 2010). About 6,000-8000 marine fish are associated with coral reefs (Census of Marine Life, 2010). Over 2,250 marine ornamental fish species are traded for the aquarium hobby (aquariumtradedata.org). About 330 marine ornamental fish species have been captive-bred (Coral Magazine). About 70 marine ornamental fish species have been produced commercially (Coral Magazine). The retail trade of marine aquarium fish is valued at close to half a billion dollars a year, with 18 to 30 million marine fishes traded globally each year. Damselfish, anemonefish, and angelfish constitute over 50% of the global volume; butterflyfish, wrasses, blennies, gobies, triggerfish, filefish, hawkfishes, groupers and basslets account for 31% of the trade, and the remaining 16% is represented by 33 families (Bruckner, 2005). The marine ornamental fish trade began in the 1930s in Sri Lanka, spread to Hawaii and the Philippines in the 1950s, and expanded to a multi-million dollar industry in the 1970s with fisheries established throughout the tropical Pacific, Indian and Atlantic Oceans. In 2004, 45 countries supply global markets an estimated 14-30 million fish annually, with an import value of US$28-44 million (Bruckner, 2005). Southeast Asia is the hub of this trade, supplying up to 85 percent of the aquarium trade (Bruckner, 2005). The largest suppliers are Indonesia and the Philippines, followed by Brazil, Maldives, Vietnam, Sri Lanka and Hawaii (Bruckner, 2005). The U.S. is the world’s largest importer, followed by the European Union and Japan (Bruckner, 2005). 2011 World Resources Institute report: “Reef at Risk Revisited”. According to the report: “The majority of the world’s coral reefs are threatened by human activities. Over 60 percent of the world’s reefs are under immediate and direct threat from one or more local sources, such as overfishing and destructive fishing, coastal development, watershed-based pollution. Of local pressures on coral reefs, overfishing—including destructive fishing—is the most pervasive immediate threat, affecting more than 55 percent of the world’s reefs. Coastal development and watershed-based pollution each threaten about 25 percent of reefs. Marine-based pollution and damage from ships is widely dispersed, threatening about 10 percent of reefs. Approximately 75 percent of the world’s coral reefs are rated as threatened when local threats are combined with thermal stress, which reflects the recent impacts of rising ocean temperatures, linked to the widespread weakening and mortality of corals due to mass coral bleaching. Local threats to coral reefs are the most severe in Southeast Asia (95 percent of reefs are threatened) and least severe in Australia (14 percent threatened). The greatest driver of increased pressure on reefs since 1998 has been an 80 percent increase in the threat from overfishing and destructive fishing, most significantly in the Pacific and Indian Ocean regions. This change is largely due to the growth in coastal populations living near reefs.